What is an outboard trolley? Your outboard motor is a hefty piece of machinery and not always easy to lug about. Outboard trolleys transport your heavy boat motor safely and efficiently. Made of aluminium, trolleys come with wheels with which to manoeuvre your outboard motor, and safety grips for your hands. Outboard trolleys come with lightweight frames that are very easy to carry for you and your vehicle. An outboard motor trolley consists of a stainless steel axle, aluminium frame and pneumatic wheels. Lightweight motor trolleys exist as another option to put your outboard motor in place. Outboard trolleys allow you to conveniently store and move your motor, and make it easier to service your equipment. Trolleys also bolt directly onto your caravan, trailer, camper trailer or other land vehicle. Why should I buy an outboard trolley? Whether you use your boat for fishing, or simply to cruise the estuaries, your boat is a valuable asset. As a boat owner you want to take care of your water vehicle to prolong the longevity of it. You also want the ease of getting your boat into the water as quickly and safely as possible. Your outboard motor is a necessity for your boat, without it, you wouldn’t go anywhere. Your boat motor’s propulsion system, engine, gear box and jet drive is a hardy piece of machinery because it powers you across the ocean and estuaries. Having said that, unexpected manhandling of your outboard motor can sometimes lead to unnecessary damage. You want to avoid that. What if, in an attempt to lift your boat motor, and you drop it by accident? That’s the sort of issue we are talking about. You try your best to take care of your outboard motor, but sometimes accidents happen. A trolley will at least prevent a drop accident when you drag your motor from your vehicle to your boat. You really shouldn’t try and lift your outboard motor, particularly as a hefty machine some 30kg or more. Regardless of your strength, you could lift your motor in a way that causes an unhealthy injury. Save your back and shoulders from unnecessary stress and potential harm! Think about it; would you carry big bags of cement, without a wheelbarrow? Some of you might, but it isn’t a good idea. When you have access to lightweight transportation, you may as well take advantage of that. If you suffer an injury, you won’t be able to get out in your boat as frequently as you’d like to. You wouldn’t want that now, would you? That’s why you need an outboard trolley. Trolleys are typically less than 10kg, therefore lightweight and easy to manage. 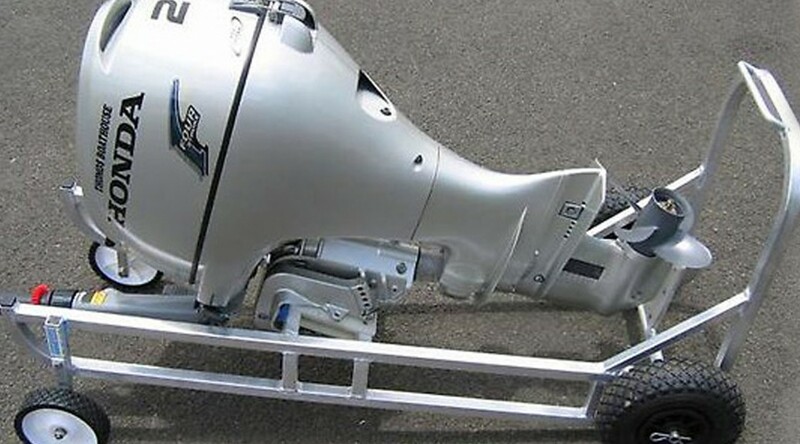 If you want the quickest and safest method to transport your boat motor, an outboard trolley is the way to go. Dragging your outboard motor around isn’t good for you or your equipment. It is also time consuming to manually manoeuvre your boat motor. The time you spend getting your motor to your boat and ready to go, is time you could have spent IN the water. You want to be out on the water as quickly as possible! Time is saved when you get yourself an outboard trolley. An outboard trolley wheels your motor to the back of your vehicle, and to and from your boat in the quickest and safest way. In the market for an outboard trolley? Whether you’re updating an old trolley or buying a brand new addition to your boating endeavours, Bundaberg based Almac Trailers will help you. Specialising in boat trailers, outboard trolleys and boat loaders, Almac Trailers make your boating life easier. The outboard trolleys available through Almac Trailers are perfectly suited to Bundaberg lifestyles, because they are Queensland designed and manufactured. At Almac Trailers, we can cater to all your outboard trolley needs with our high quality selection of long shaft and short shaft outboard trolleys. Come and visit Almac Trailers at 46 Alexandra Street. We’re open Monday to Friday 9am – 5pm, Saturday by appointment only. Alternatively, give us a call with your outboard motor questions on 07 4152 3737, or get in touch via the online application form and we will call you back. Need helpful advice about the size and shape of your outboard trolley? Almac Trailers can help! Previous PostHow to Choose a Boat TrailerNext PostHappy Customers!